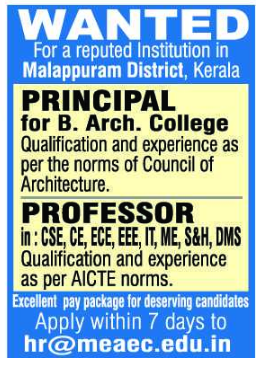 MEA Engineering College, Malappuram has advertised in THE HINDU newspaper for recruitment of Teaching Faculty- Principal / Professor jobs vacancies. Interested and eligible job aspirants are requested to apply within 07 days from 17th January 2019. Check out further more details below. About College: MEA Engineering College, the second self financing engineering college in Malappuram district, is committed to provide excellent and value-based education with a flair for ethics and professionalism. The College is located amidst panoramic natural beauty over-looking the hills and valleys at Nellikunnu, near Perinthalmanna, a city of various educational Institutions, situated on the Perinthalmanna-Melattur state highway. The College is easily accessible by road rail and air.